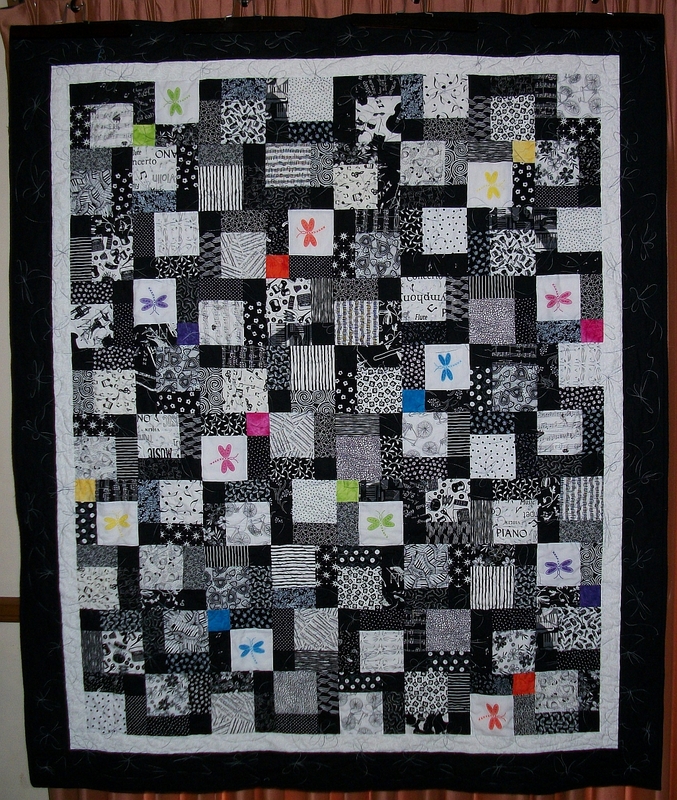 Posted by Pam in KC in Baby Fox & Geese, Dragonflies, UFO Challenge 2011. 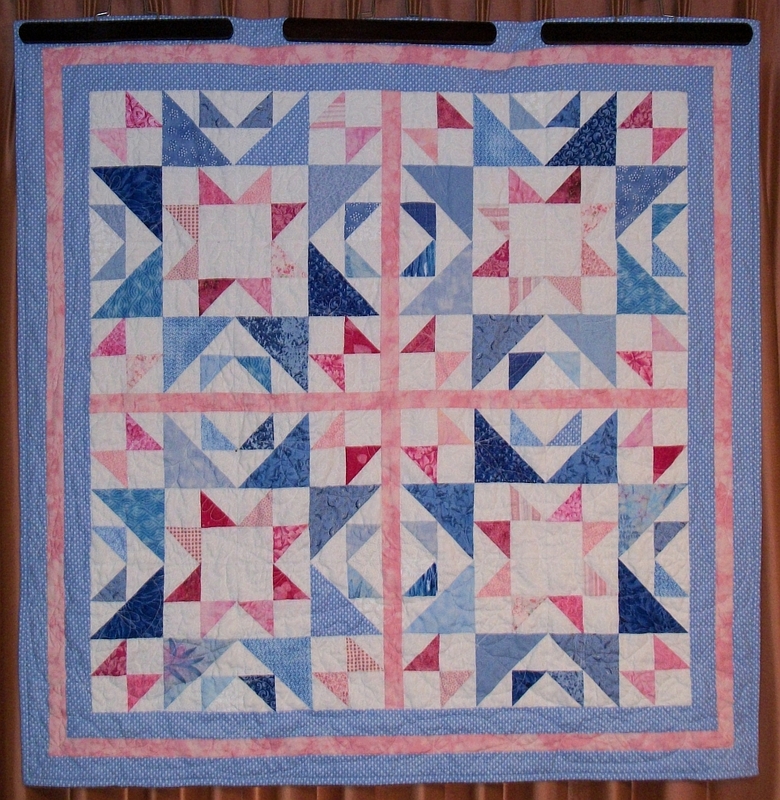 Admittedly this pink and blue quilt is listed as #7 on my UFO Challenge list, but I did say there may be occasions where if a quilt needed to get bumped up, I’d swap #s. So, I’m swapping #7 for #1. It just didn’t seem right to use my bunny quilt to meet this month’s challenge since it wasn’t list on the UFO Challenge tab — although it was on either the “tops to be quilted” or “quilts in progress” tab at the beginning of the year. Anyway, this quilt got bumped to the front of the line so I could practice quilting dragonflies. For the backing, I used a piece of vintage fabric I got from my friend S when she was cleaning out her stash a year ago. Come to think of it, the blue & white hearts came from her stash as well. The quilt is approximately 39″ square. I used Warm & Natural batting, King Tut # 993 (white) in the top and Bottomline in the bobbin. The binding is stitched down by machine — I can’t think of any binding I’ve done by hand. 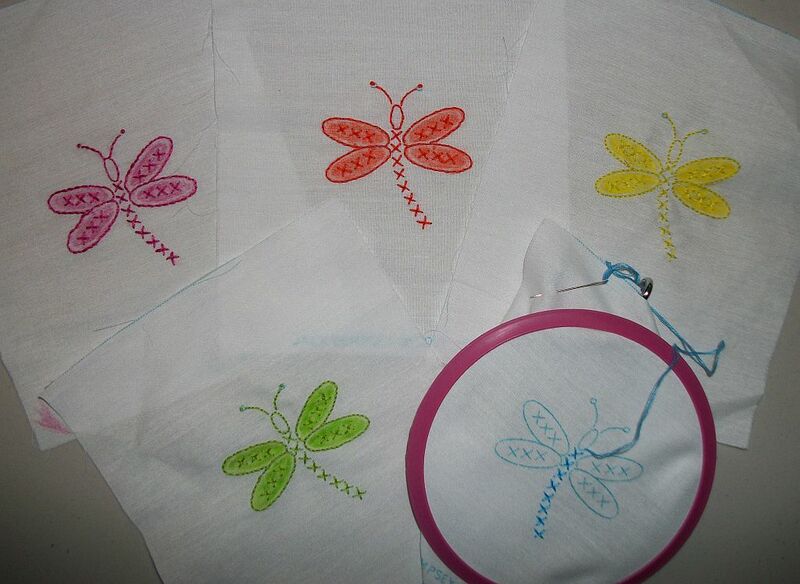 Now on to the next quilt – Dragonflies. This is the first of the seven quilts I need done by the end of June. Here’s a closeup of the quilting. My dragonflies were various sized and going every which way. I opted for King Tut # 978 – Rosetta Stone in the top. I wasn’t gutsy enough to use the bright thread. White thread in the bobbin. So essentially you can’t see my quilting — which at this point is a good thing. After washing the quilt measures 57 x 68. I used Warm & Natural batting in this one as well. Posted by Pam in KC in designwall, Dragonflies. No piecing this week. I’ve got the binding attached to the baby quilt and hope to get it sewn down tonight. Then I’ll trim the Dragonflies and work on binding it. Stay tuned for better pictures later in the week. In the mean time, check out the links over at Patchwork Times for great inspiration. Posted by Pam in KC in Dragonflies. I’ve just finished putting the border on Dragonflies. The top measures approximately 60 x 72. Tomorrow’s task to to make the backing for this quilt and Victoria’s Rose. This afternoon I took a file box of quilting books, patterns, and magazines to Fabric Recycles. They will purchase your unwanted fabric, notions, and pattern for either cash or store credit, or you can simply make a donation. 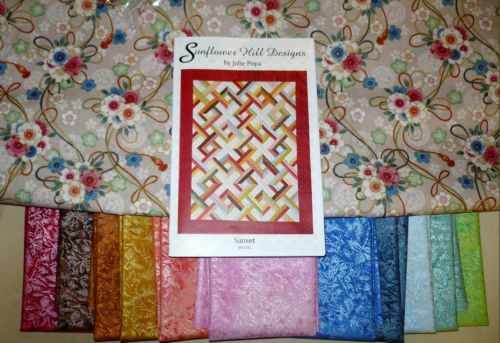 While I was waiting for the offer on my stuff, I looked for backing fabric for the other 4 quilt tops which I will be quilting over the next 14 weeks. It will be perfect for the backing of Victoria’s Rose, and at $2 a yard, I can’t beat the price. I paid for it from the cash I got for my box of books and pattern and still came home with money in my pocket. I wasn’t able to find anything for my other quilt tops, but I’ll try to swing by there the next time I’m out and about to see if anything new has come in. This past weekend I worked on my Dragonfly quilt. It still needs borders, but I need sleep more. After work I’ll get the rest of the borders on and perhaps get the backing pieced. 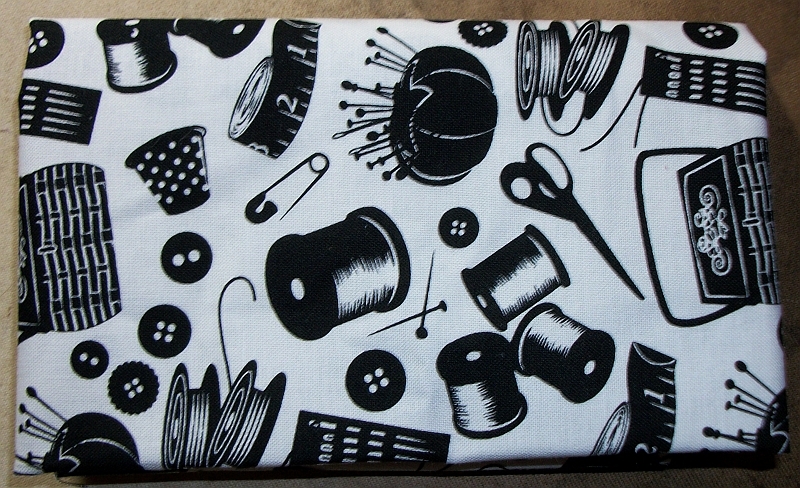 Isn’t this fabric perfect for the backing? 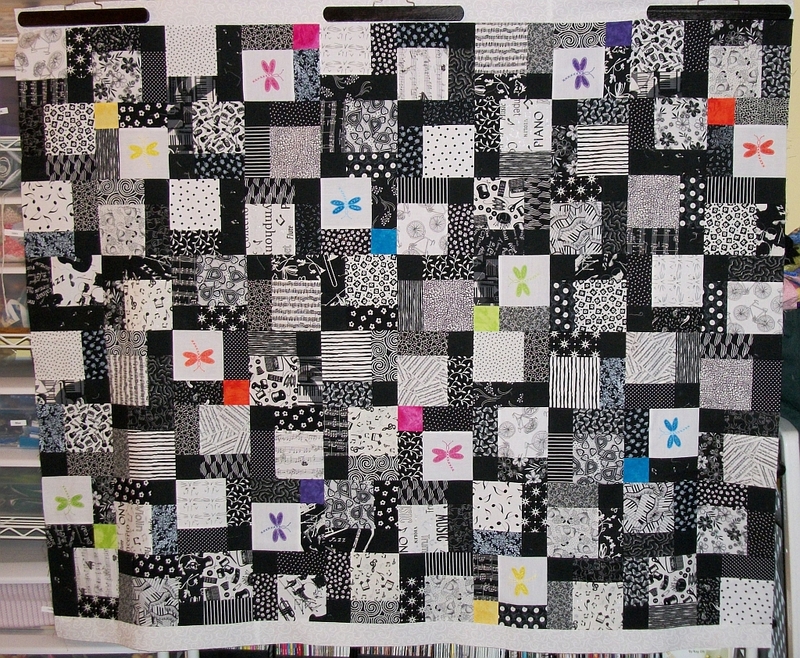 I’ve got an appointment in Butler on the 27th to quilt this top, so I’ve got to practice drawing dragonflies. While I’m doing that, I’ll ponder thread color. I have a spool of King Tut #901 Nefertiti which is Green, Fuchsia, Yellow, and Orchid. 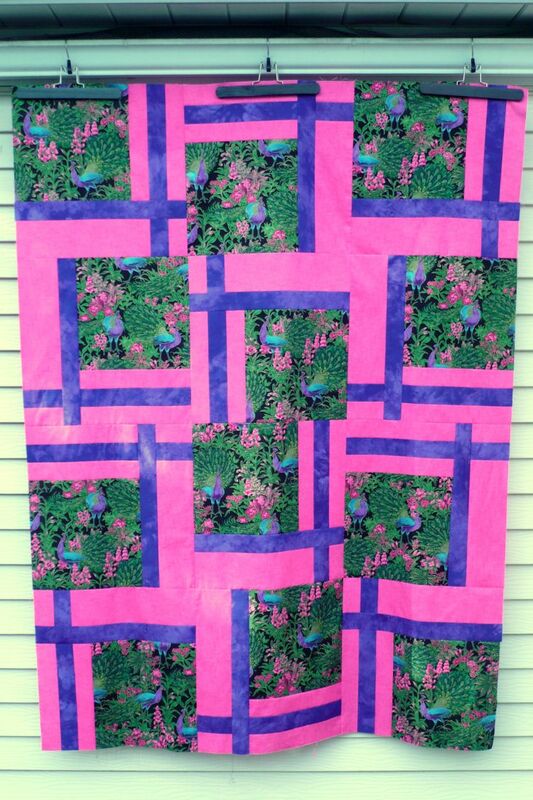 This is the thread that I used to quilt No Blue Geese in My Tropical Garden. It’s missing orange and turquoise. So, I wonder about using # 978 Rosetta Stone which is a Light Silver, Charcoal and Dark Silver – but the Superior website says this is out of stock, so that may solve the problem for me. 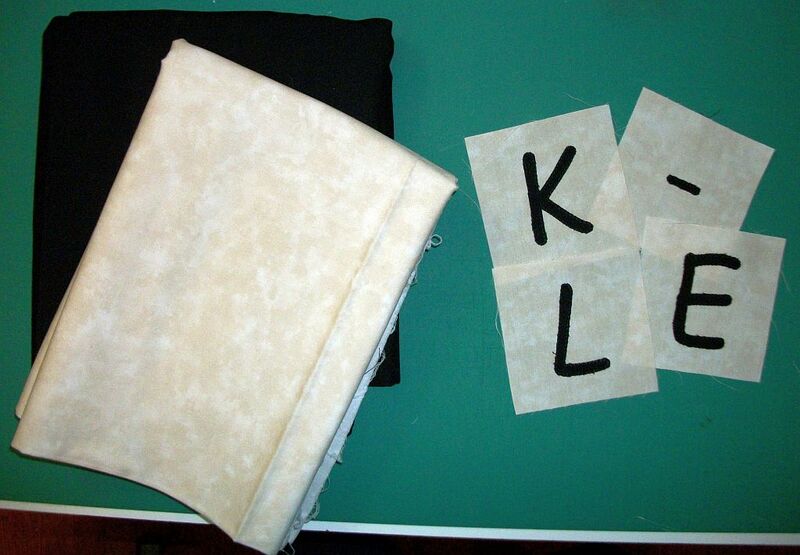 There will be an outer black border and the binding will be black as well. Follow the links over at Patchwork Times to see what others are working on. Posted by Pam in KC in 2011 Mystery Quilt, BQ2, crossword, Dragonflies, Fun with Bricks, OTR, The Chain Event, UFO Challenge 2011, Victoria's Rose. I started off the year with a bang, but here we are a bit over 10 weeks into the new year and I have 3 quilts completely cut out — 2 with the borders! This is cannot be good for the UFO count. To further illustrate that I’ve lost my mind, I’m planning on taking all 3 of them with me this weekend to a sew-in. The bag on the left is Bonnie Hunter’s Fun With Bricks. This started innocently enough as a leader/ender project in January. The bag on the right is the Dragonfly quilt. 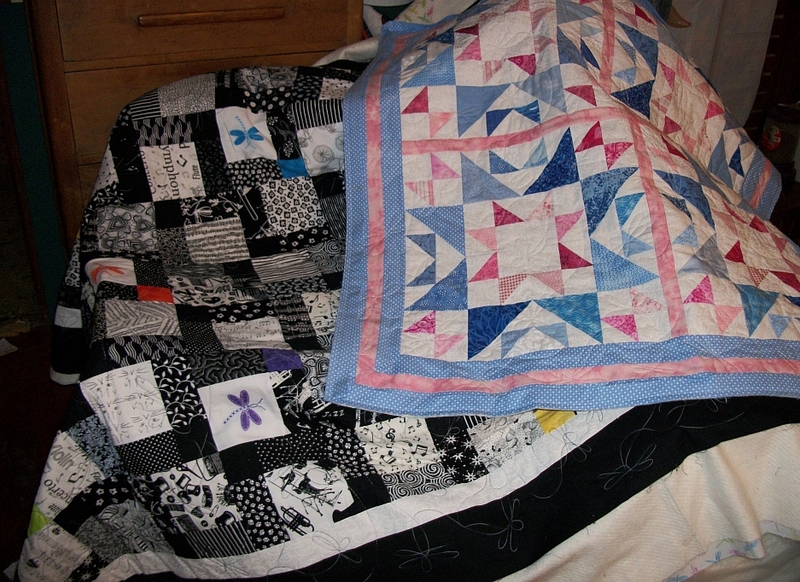 The middle is a red, white & blue scrappy twin size version of the Mystery Quilt I wrote for the April retreat. Add to this that my husband has just convinced me that I need to quilt and bind six quilts before the end of June and now I know I have lost my mind. This does not include anything which is on my UFO list or any other project I want to finish sooner than later. 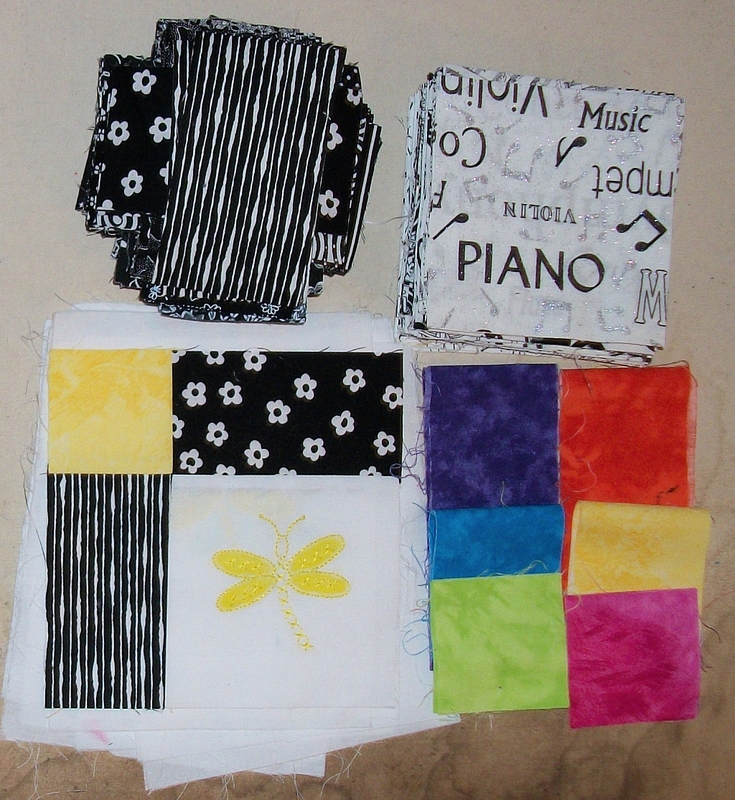 At least four of the quilts are completed tops. Quilt #1 – 54 x 70. I have enough fabric to make a second identical quilt and bind them both in the purple. I may use the fabric to make the backing. No idea on the thread color or quilting motif. Quilt # 2 – 70 x 100 When I started the quilt in Purple, Green & Yellow, I was thinking “Mardi Gras” and purchased either 1/2 yard or yard of Mardi Gras frogs. I may look for some more Mardi Gras fabric for the back. The purple binding is made and tucked in with the quilt and frogs. Quilt # 3 – 68 x 86. I have a piece of the border fabric left in the stash. The floral, pink and green fabrics, along with a stripe and a small floral print were part of a bundle. 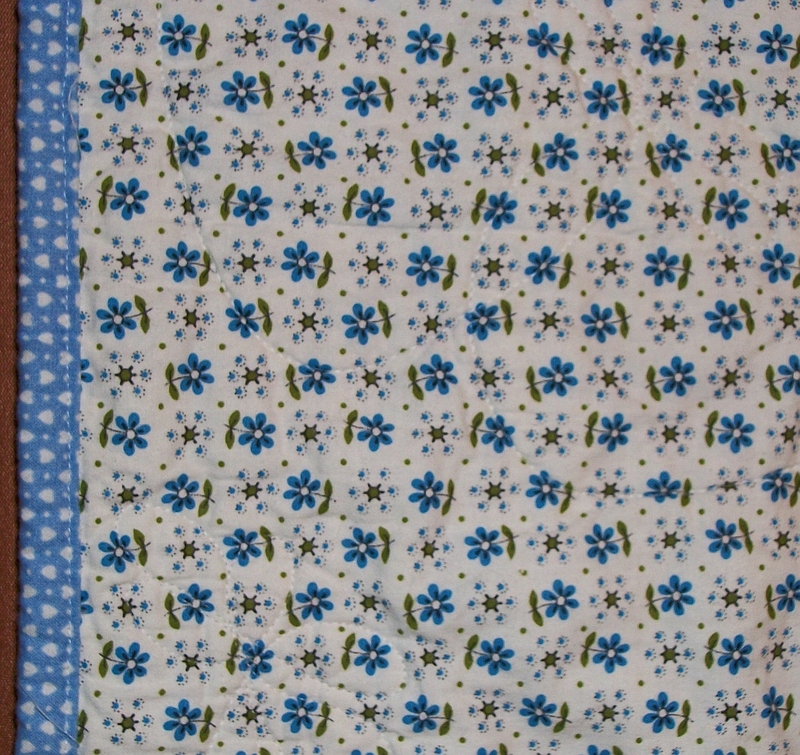 I found more of the floral on-line, but don’t think I there is enough for the backing. My spreadsheet says I have ‘binding fabric’. Oh, my. I just thought of something. I really want pillow cases to go with each of these quilts. Have I mentioned I’ve lost my mind? Quilt #4 – 74 x 88. I thought I had backing fabric for this quilt top, but when I inventoried my quilts tops and UFOs last year, I discovered I only had binding fabric. Quilt # 5 – 60 x 76. It’s a variation because I’m not making 9-patches and I’ve changed the size of the pieces. It just worked better for the size quilt I wanted to make. Fortunately I have the backing fabric – a great dragonfly print I found on-line and the binding has been cut, just not made. 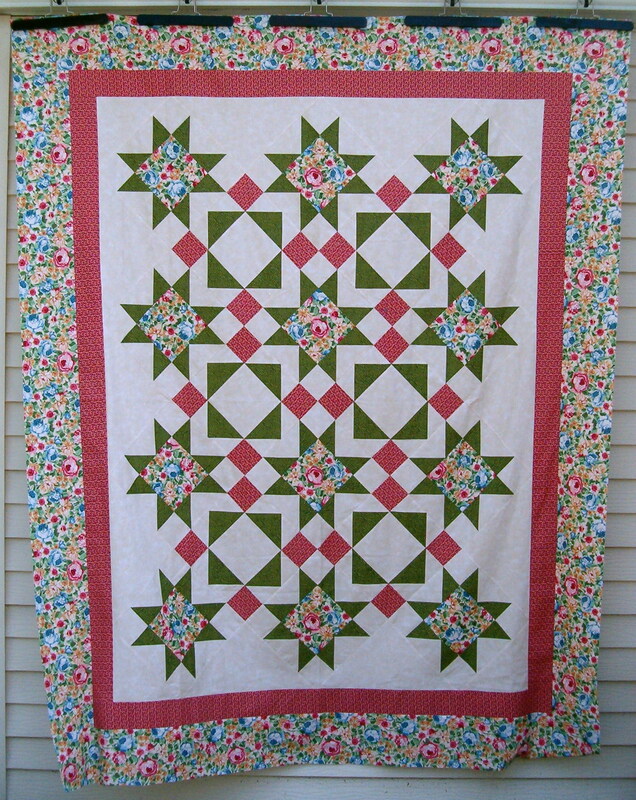 So, if I finish piecing the top this weekend, this will be the first quilt I get done. Quilt # 6 – size unknown. The size is unknown because this is still a work in progress. I have about 1/2 of the letters made. This one is going to the April quilt retreat. 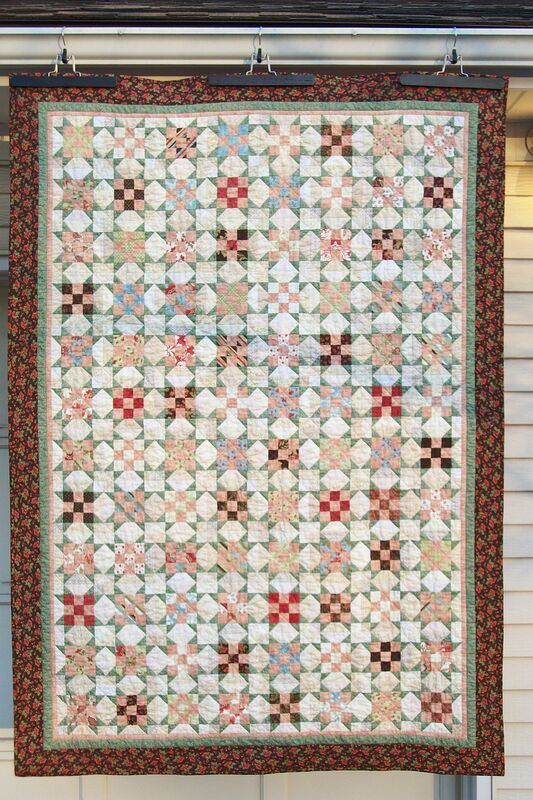 There will be occasions when a quilt will need to get moved to the top of the line regardless of the # pulled for the month. In those instances, I’ll either swap the #s if they are on this list, or if the quilt doesn’t have an assigned #, but is on either tab as of January 1, 2011, I’ll substitute it for the current # drawn. After all the goal is to get quilts off the UFO list. Posted by Pam in KC in Colorworks Dresden Plate, Dragonflies, Fun with Bricks, Stash Busting Report. Nothing in this week — well, a friend did just give me a stack of blocks, but that doesn’t count on the Stash Report — the Tops in Progress list, maybe. As for fabric usage the beginning and ending of the week saw me cutting fabric for the dragonfly quilt. In between I worked on the Dresden Plate quilt. I cut the dark fabrics for the dragonfly quilt early in the week and then put it up to continue working on the Dresden Plate. 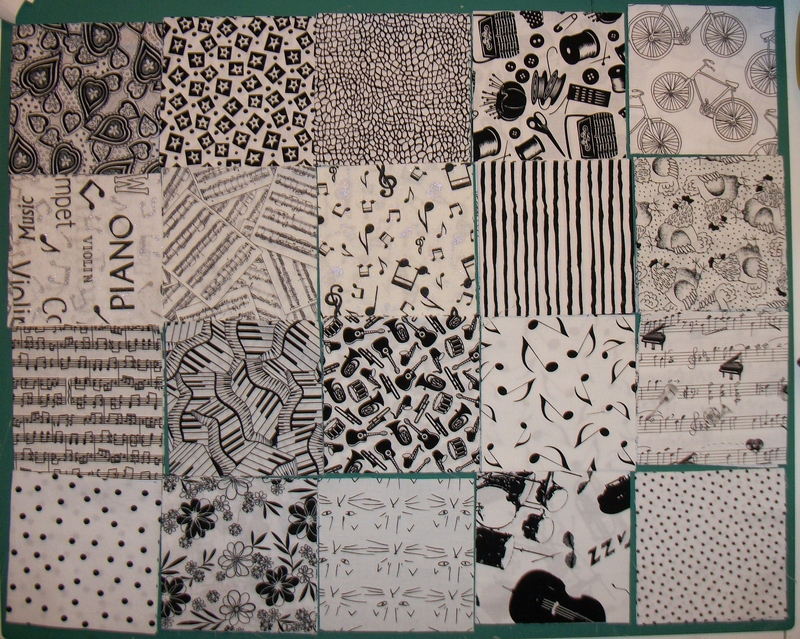 By the end of the week I had to cut more background squares for the Dresden Plate. From each width of fabric I got two backgrounds and a dozen squares for the Dragonfly quilt. So, I guess I’m committed to the solid black for the Dragonflies. I think I have 6 1/2 yards left, plenty to do the borders and bindings of both quilts and then some. And yes, I added the black squares to the bag of fabric for the dragonflies and will work on them at the sew-in next month – unless I finish the Dresden Plate before then. 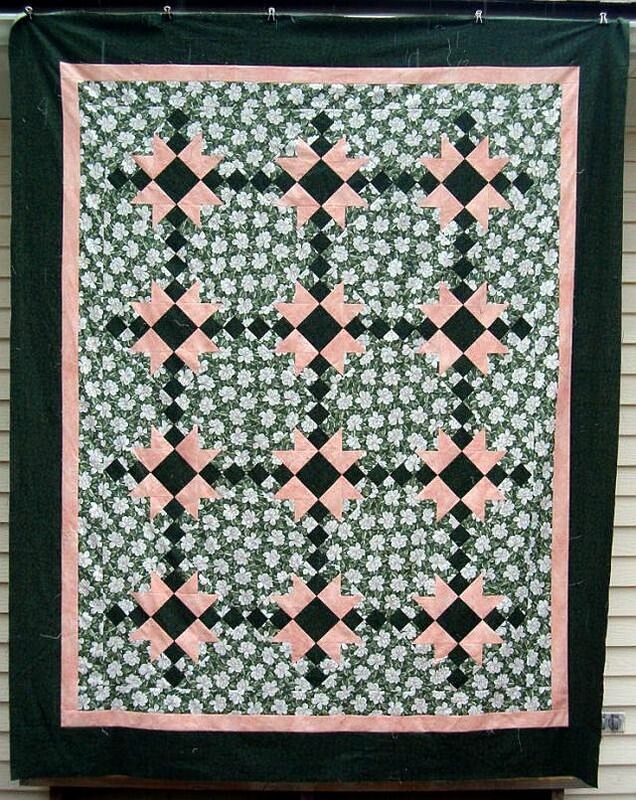 Of course, in surfing the web, I found a postage stamp quilt that I started drooling over. I had to give myself a stern talking to about NOT digging into my 1 1/2″ strip box and cutting squares to use as leader/enders. I don’t want another new project in my life at this point in time — not to mention that I have a stack of bricks to stitch together for a Fun with Bricks quilt, which I started as my leader/ender project last month. Check out how others are doing by following the links over at Patchwork Times. Posted by Pam in KC in Colorworks Dresden Plate, designwall, Dragonflies, UFO Challenge 2011. Or perhaps a better title is Why UFOs are Created. Last week I ran into an issue with my Dresden Plates. No, it’s not getting them to lay flat — although that can be a challenge — but rather I sewed the petals in the wrong order and didn’t discover it until I clipped and turned the plate. Argh! There was no salvaging that plate and since I used a smaller stitch, I wasn’t looking forward to ripping out the stitches on the 2nd plate sewn wrong, but not yet clipped. So, I cut more petals – enough for 4 plates so I didn’t have to rip out the two plates I did back when I was first working on this project. Between this and that, all I accomplished on the Dresden Plate was getting the 4 new plates sewn together and prepping the centers . So, now there are 8 days left in the month and I’m supposed to finish the Dresden Plate because it’s UFO # 10. So did I work on it over the weekend? 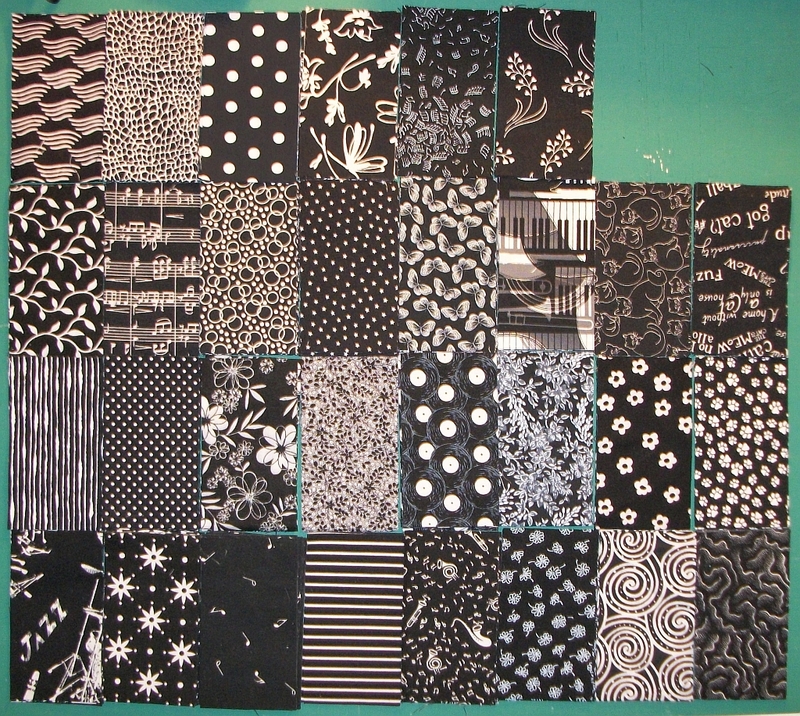 No, I finished up the Dragonflies during the week and decided I needed to know if I had enough black and white fabric for the quilt. I did, so I starting cutting the fabric, essentially starting a new quilt over the weekend. Although technically it’s not a new quilt since I started the dragonflies last August. I even held back on cutting the black squares, but that didn’t stop me from putting one block together. The yellow square was easy to cut from the yellow strip I’ve been hauling around since August. The only reason I don’t have more dragonfly blocks done, is I’ve got to trim them and that was going to take some time. So, the Dresden Plate quilt could easily get set aside for the “new” quilt. It’s more exciting. It’s new. I want it finished by early April, and there’s no way I’m going to finish the Dresden Plate by the end of February, so give up and work on the new quilt. 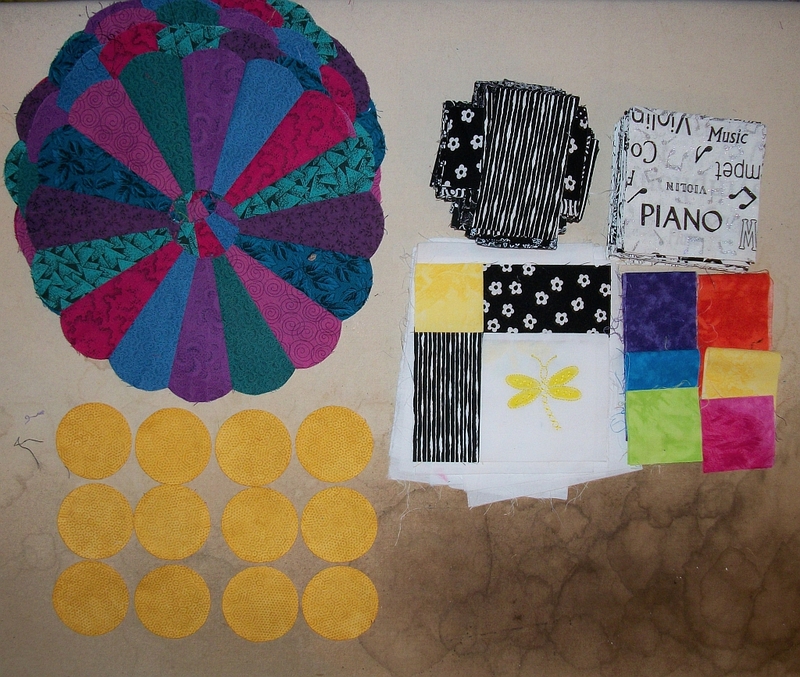 But, instead I’m going to buck up, put the pieces for the dragonfly quilt in a bag and set it aside to work on next month. I’ve checked my calendar and there’s nothing on the schedule after work this week, so there should be nothing to prevent me from making progress. If As I make noticeable progress on the quilt, I’ll post pictures. But until then, I may be incognito. Meanwhile, check out the quilts being worked on by others by following the links over at Patchwork Times. Posted by Pam in KC in Dragonflies, Stash Busting Report. I really haven’t fallen off the face of the earth. If it wasn’t one thing it was another. There wasn’t much quilting/piecing going on this past week, although if you looked at my ironing board this afternoon you wouldn’t believe me. Can you see those Dresden Plate petals at the top left of the picture? Those are the replacement petals I cut. I went ahead and cut 4 sets – one to replace the plate I clipped before discovering I sewed it together wrong; one to replace the 2nd plate I sewed wrong and is already attached to the interfacing and finally two to replace the two I previously sewed and aren’t aligned correctly. Are we sure this is a UFO? Since I appear to be starting from scratch it almost seems like a new quilt. The rest of the mess on the ironing board is the fabric I pulled for my Dragonfly quilt. The black is the same black I’m using for the Dresden Plate. I’m not too fond of it since it attracts lint from the entire metro area. But that is a six yard piece (or maybe there’s six yards after I pull the two yards I need), so I can’t justify buying more fabric. I even went to the quilt store yesterday with a gift certificate in my pocket and didn’t buy any fabric – although this FQ did come home with me. This was my “prize” for finishing Three Sisters’ Choice. It’s one of the quilts on my UFQ list at the quit shop. I picked this FQ since it could be worked into the Dragonfly quilt. I’ve got half of the fabric cut. 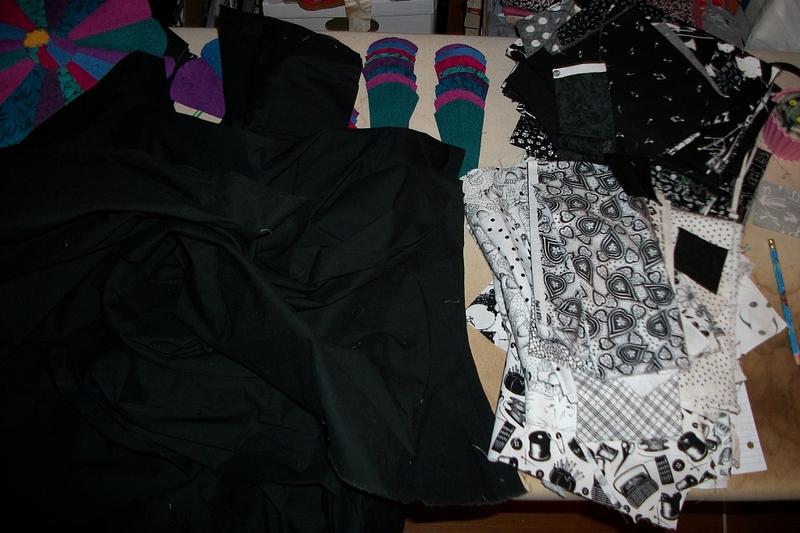 I still have to cut the black squares and rectangles before I can begin sewing. So, why am I cutting fabric for the Dragonfly quilt? I finished embroidering them this week. Working on these I discovered a couple of things. A freshly sharpened Crayon delivers more color than one which has been used. Also, to get the blue ink out of the fabric, I filled a bowl with soapy water and soaked the pieces for “a while”. They rinsed clean. Pardon me while I record the Crayola Crayon Colors and DMC Floss #s. I figure if I do this now, I’ll have the information if I need it later. The DMC #s may not be current. Some of this floss could be from before I got married 25 years ago. The crayons are from a box with a 1990 copyright date on it. 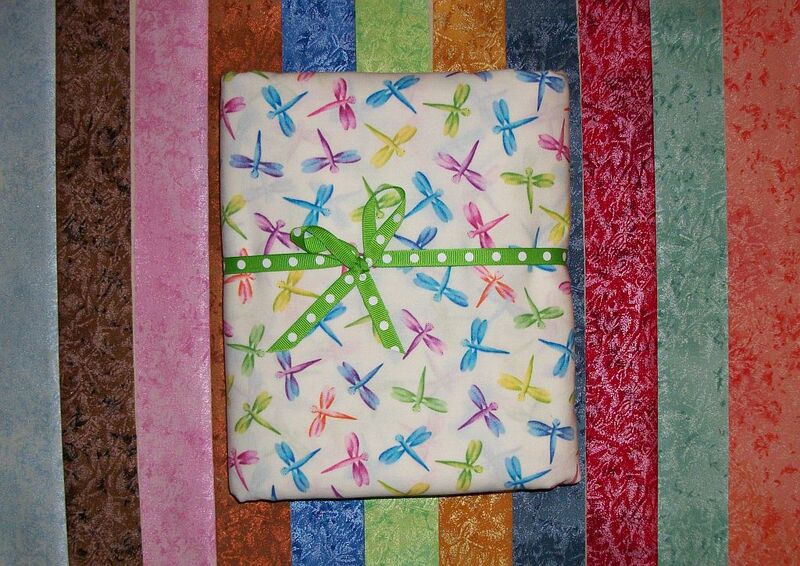 Four yards of Rrrbbit – Multi colored Dragonflies by Barb Tourtillotte for Clothworks. 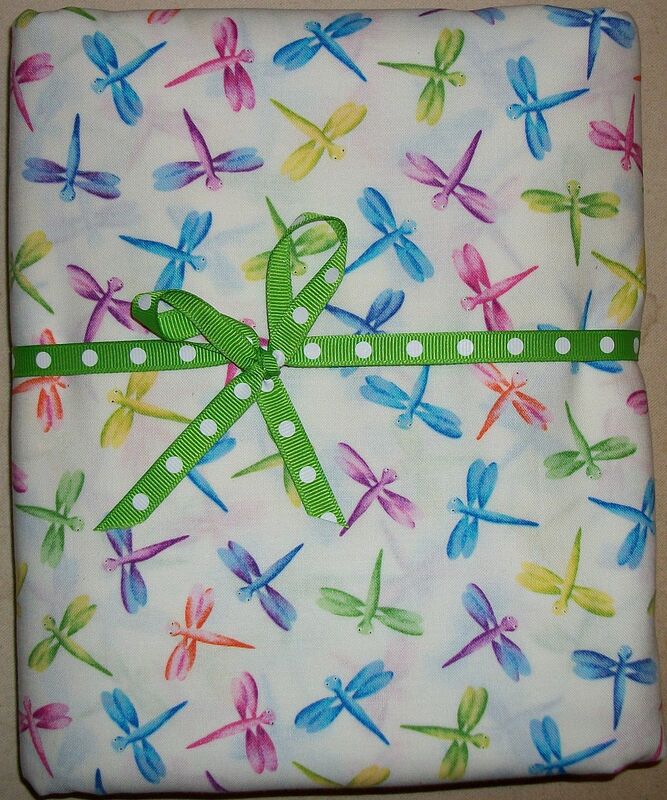 I ordered it from The Quilt Shoppe last week to use as the backing of my Dragonfly quilt. It is even better than I expected. Look at how close my dragonflies match the fabric! I had no idea this fabric was out there. 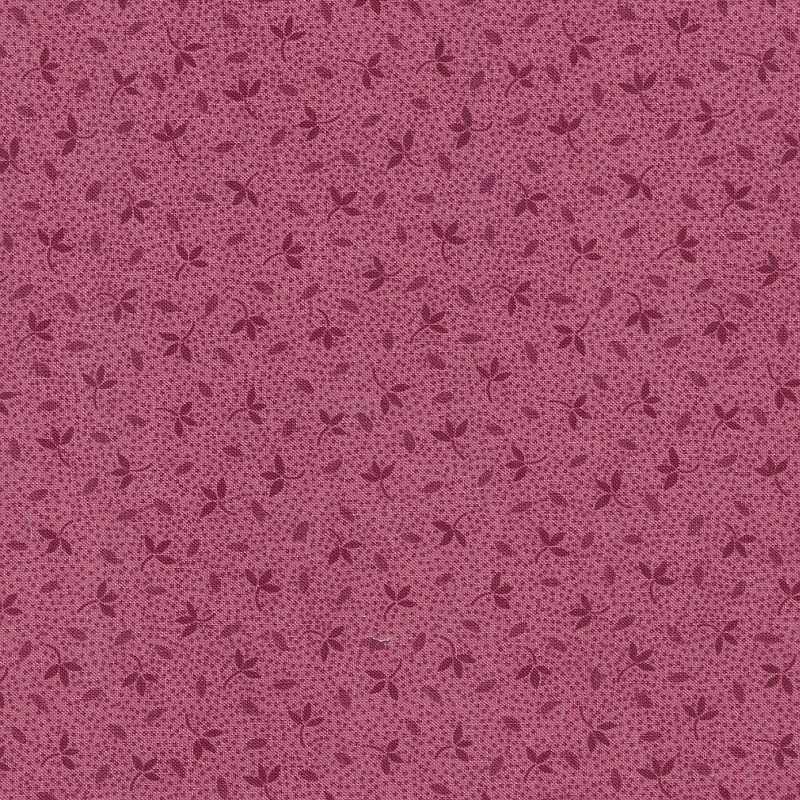 Labor Day Weekend, I said something about looking into Spoonflower to design a backing fabric for the dragonfly quilt. After seeing how much it would cost, I used fabshophop.com and searched “dragonfly”. The fabric practically glows. 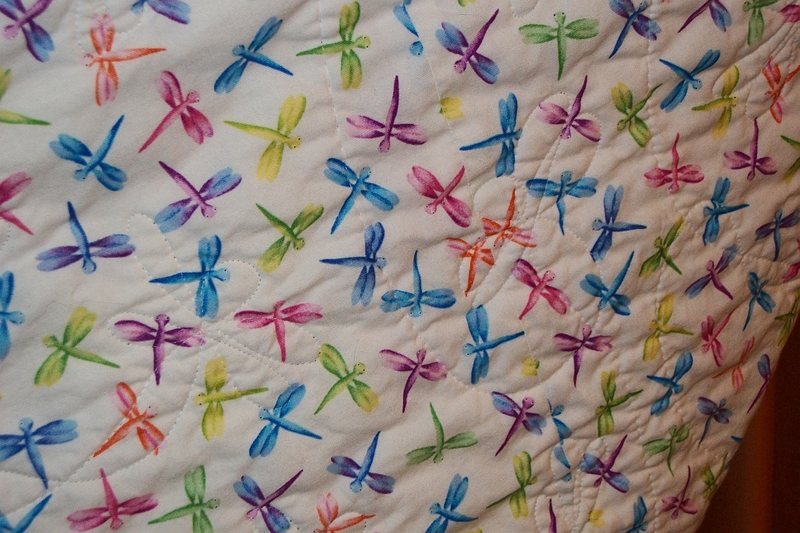 I had Fairy Frost strips on my cutting table when I opened the package (yes, I finally started this quilt) and when I set it on top of them I decided the dragonflies would look good with Fairy Frost. 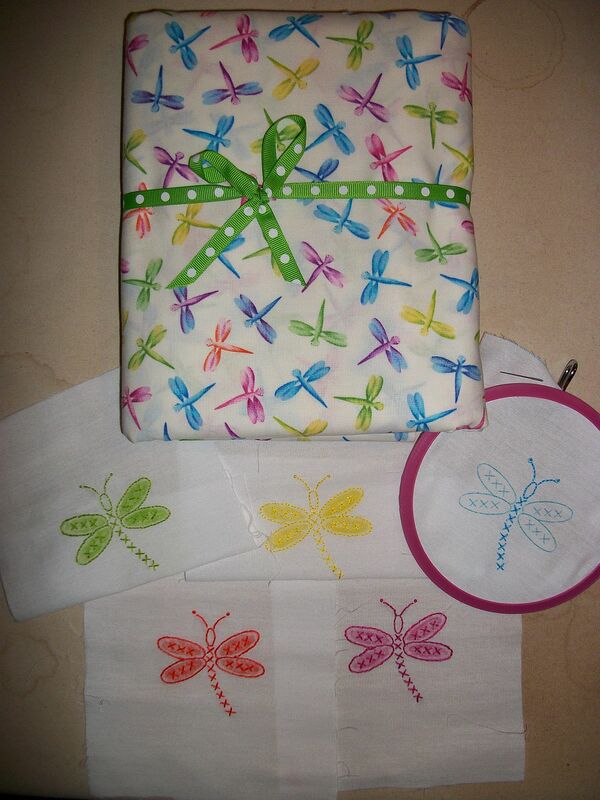 So, with the ideas popping in my head I have to decide if I want more dragonfly fabric…. 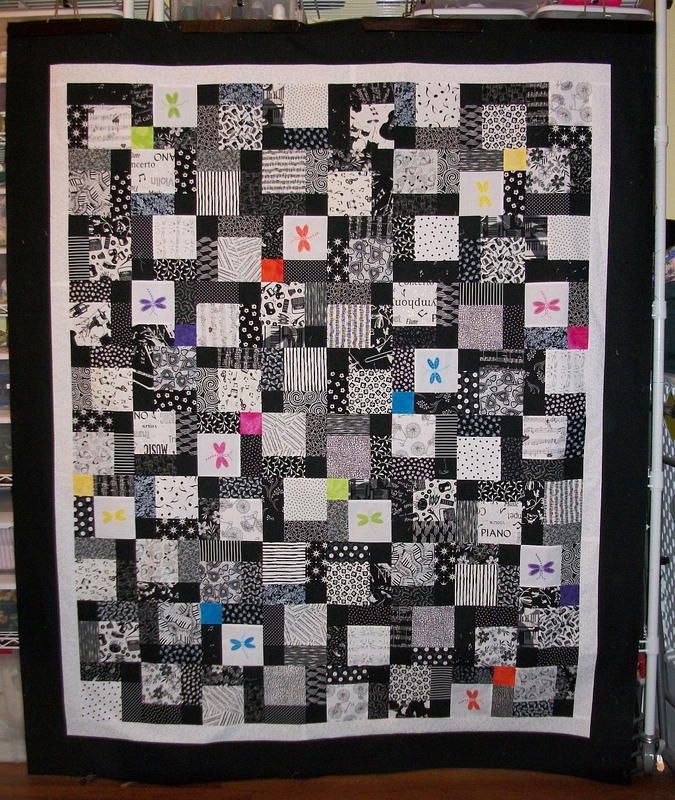 Posted by Pam in KC in Dragonflies, dwr, goals, KVQG BOM 2010. After I figured out what I was going to work on over the weekend, my DH and I made the decision to take a road trip to visit his family. Needless to say, I was limited to handwork – although I did show my SIL how to use a serger. 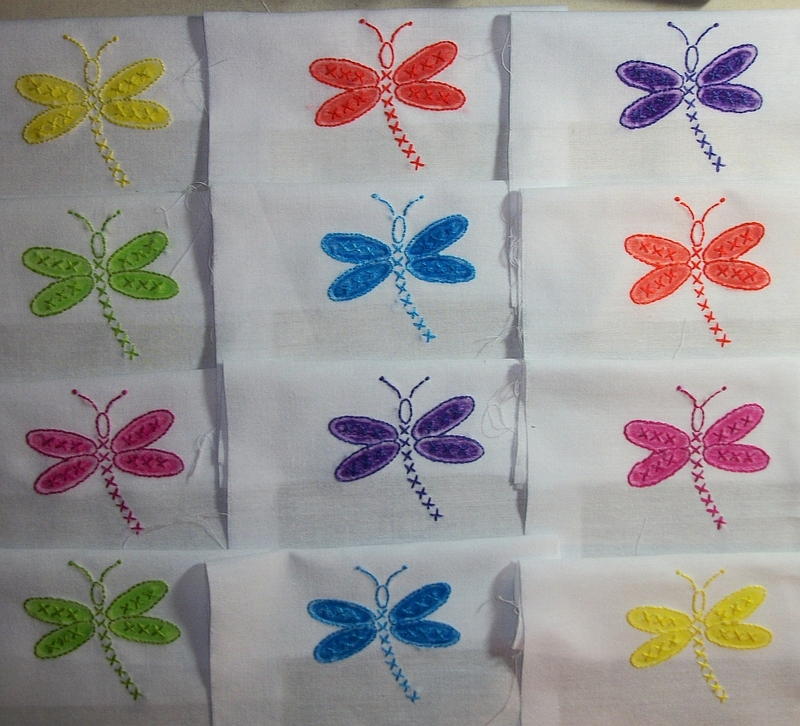 On the other hand, I stitched some of my dragonflies. There is less on this week’s list since there is no holiday to give me an extra day of quilting. Quilt daily on the DWR. 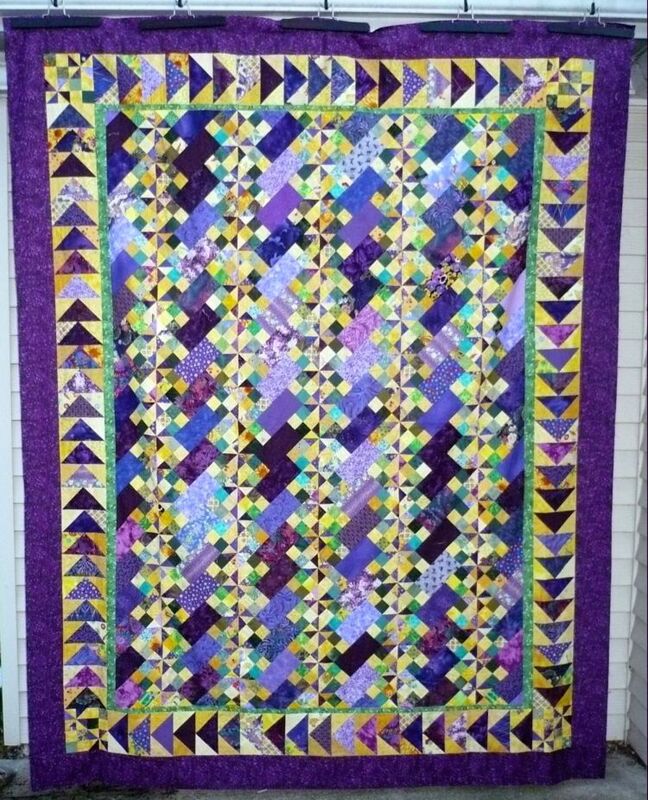 Check out the links at Bari’s to see if extra quilt was accomplished due to the long weekend. I made my first quilted item as a visual aid for a math project in 7th grade. 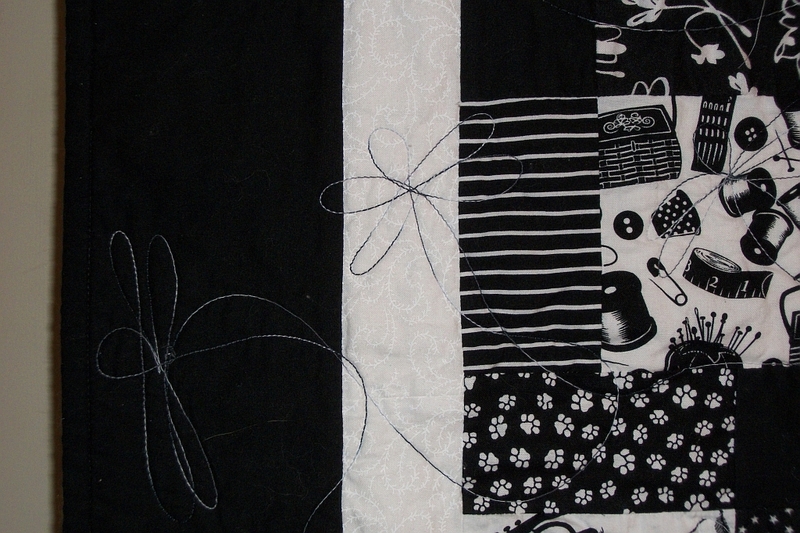 Over the next 25 years quilting was hit or miss, but quilting took over all the other crafts I've done in 2003.